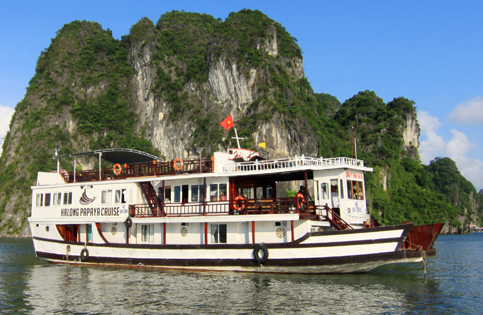 We are a company which strives for the best experience in Halong bay. The company is established in 2009. Our junks Catba Princess, Catba Imperial, Catba Legend and Catba Prince will take you to the off the beaten roads cruise in the bay far away all the big boats with a lots of tourists. 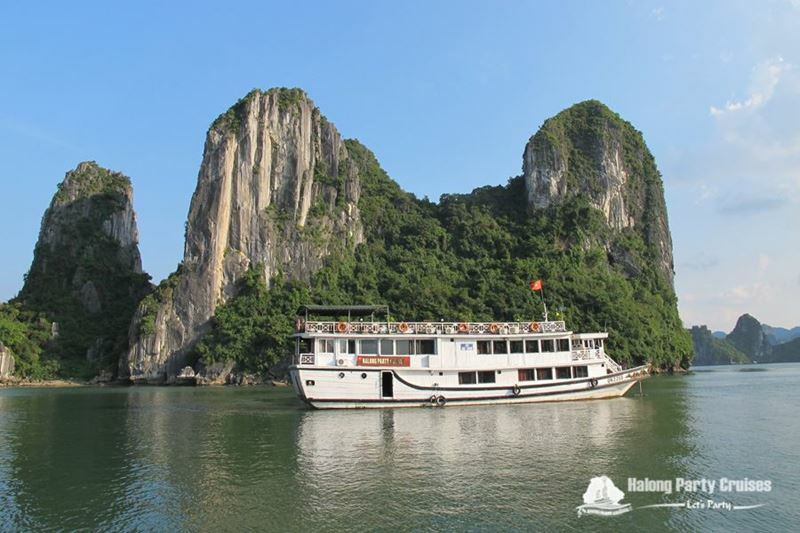 We accomplish this by offering custom tours and tours especially set up to experience the beauty of Halong bay and Cat Ba island, instead of seeing the main points. 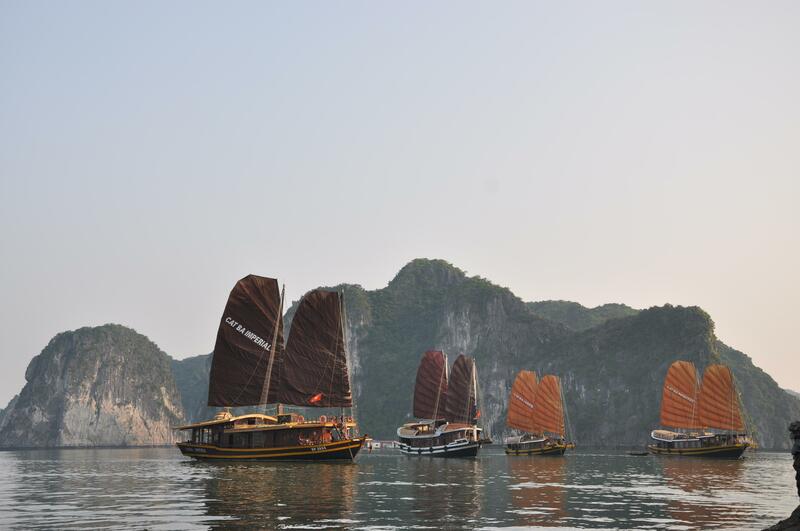 Enjoying Halong bay is best when only the beautiful islands surround you. The main starting point for setting up a pleasurable journey is to place the customers’ expectations centrally. Through close cooperation we will find the best custom tour for you. The reason why we believe in this strategy that we think expectations should always be met. 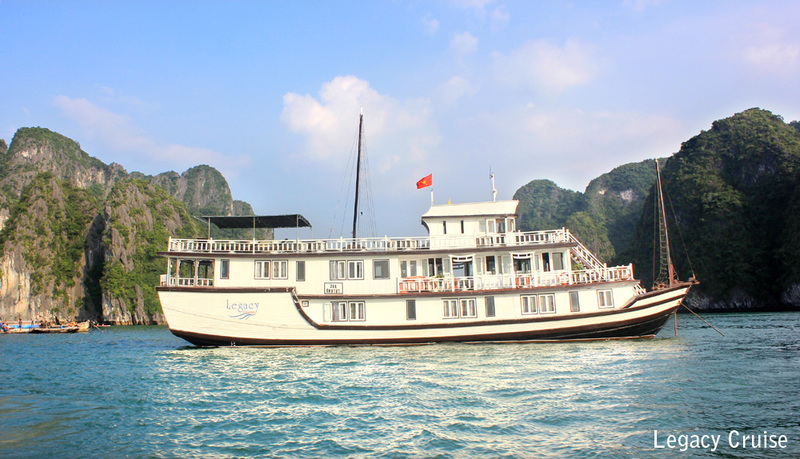 The Cat Ba Princess is a ship which is designed for a family cruise or a group of friends who enjoy sharing for the duration of the trip on this comfortable boat. Cabins	2air-conditioned14 m2each with private access and ensuite cabins with hot water at any time. Cabins	2air-conditioned cabins of 12 m2each withprivate access and ensuite bathrooms that offer hot water at any time. Entertainment, bar and dining room	25 m2, and flat screen TV for karaoke. CATBA IMPERIAL is a pearl on the bay with its beautiful decorations and size and its 4 cabins aboard. The ship is perfect for a large family or group of friends. Your cruise will be ideal on this great junk comfortable, charming, taking you off the traditional routes. Cabins	4 air-conditioned cabins11 m2each with private access and en suite bathroom providing hot water at any time. The Cat Ba Legend is one of the jewels on thebay with its ideal size, its user-friendly cabins for couples enjoying their honeymoon or a small family. It was named IndochinaSails at the beginning and renamed CatBaLegend later. - A bathroom of 3.8 m2 access from 2 cabins offer hot water at any time. - Cruise aboard our private Junks, far away from the touristic areas to ensure a peaceful and stunning trip. - Our Junks do not only provide comfort and luxury but also safety. - Delicious seafood meals served on board*. Pick up from the airport, transfer to Ben Binh, boarding on a fast ferry for a quick crossing to Cat Ba Island. Boarding on boat at 12h00 at Ben Beo harbor, transfer to our Junk with a welcome drink. The junk travel through a floating fishing village. 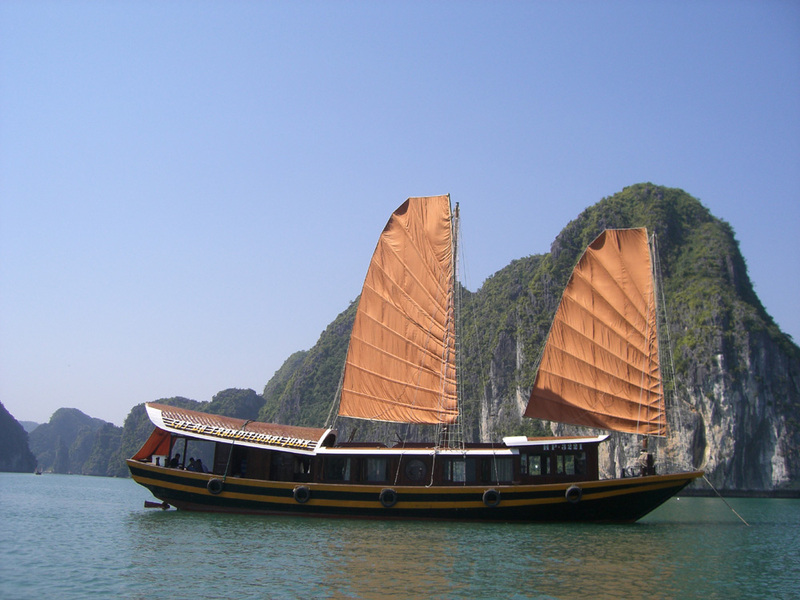 One-hour cruise in Lan Ha Bay to discover the stunning beaches of Ba Trai Dao. You have the first stop for kayaking and swimming on the beach. Delicious seafood lunch *and free time to rest while the crew will stop the engine to travel full sails in Ong Cam Bay. Finally, the Junk will drop the anchor in a remote area free of tourists. The crew prepair the fishing gear. 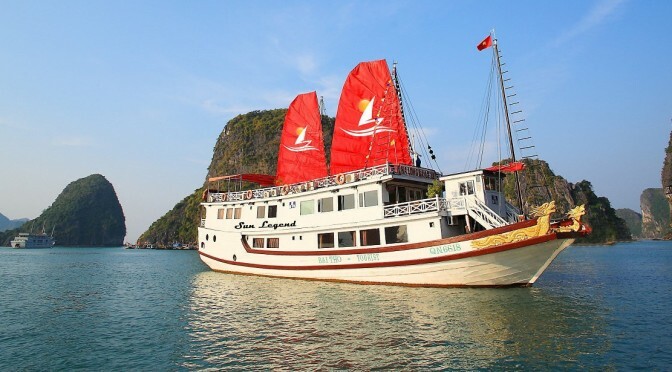 Aboard Cat Ba Princess Junk and Cat Ba Legend Junk, discover far away islands and wild bays such as Lan Ha, Bai Tu Long and Halong. Our traditional Junks are made of exotic wood and are among the only boats in the Bay capable of traveling full sail. While on board, the chef will cook for you sumptuous fresh, local seafood*. Pick up from your hotel in Hanoi. In Hai Phong, boarding on a fast ferry for a quick crossing to Cat Ba Island. Visit of Cat Ba fish market. At Ben Beo harbor, transfer to our Junk with a welcome cocktail at 12h15. Travel through a floating fishing village. Visit a fish tank. Delicious seafood lunch* and free time to rest while the crew will stop the engine to travel full sails to the floating village of VietHai, that you you will discover by biking. Back on board at the end of the afternoon. 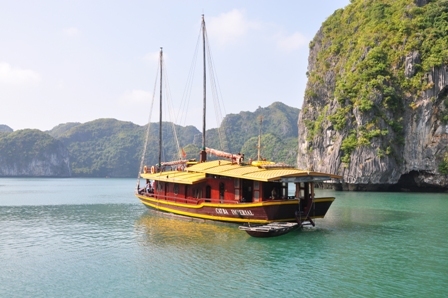 Finally, the Junk will drop the anchor in a remote area free of tourists, in Lan Ha Bay. Dinner and night aboard. Watch the sunrise if the weather makes it possible. Breakfast aboard. Cruise to Ho Ba Ham. Visit of a floating village. 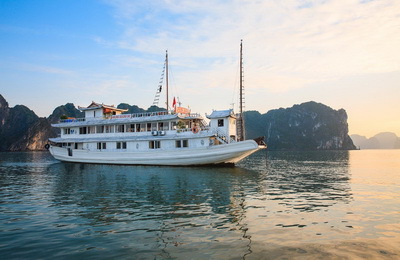 Cruise in Lan Ha Bay to discover the stunning beaches of Ba Trai Dao. Cruise towards Ca Cave. Boat-ride to CA tunnel and discover a hidden lake surrounded by cliffs full of monkeys (endangered species). Dinner and night aboard in Ong Cam area. Breakfast aboard. Cruise to Rang Dua to visit Me Cung Cave. Back on board, cruise among thousands of sugar loaf shapes. Check-out before 10am. Lunch aboard. Disembarkation at Hon Gai harbor to go back to Hanoi. Pick up from your hotel in Hanoi. At Hon Gai harbor, transfer to our Junk with a welcome cocktail at 12h15. Welcome drink. 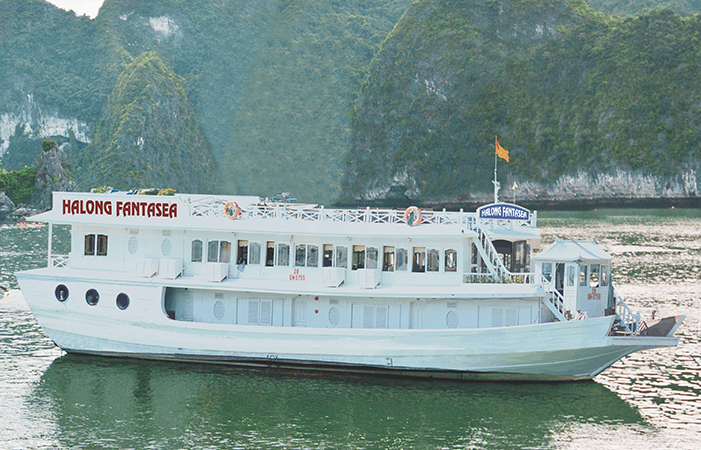 Cruise through Halong Bay to Lan Ha bay while you are enjoying a seafood lunch. Boat-ride to CA tunnel and discover a hidden lake surrounded by cliffs full of monkeys (endangered species). Finally, the Junk will drop the anchor in a remote area free of tourists, in Ong Cam. Dinner and night aboard. Breakfast aboard. Cruise to Rang Dua to visit Me Cung Cave. 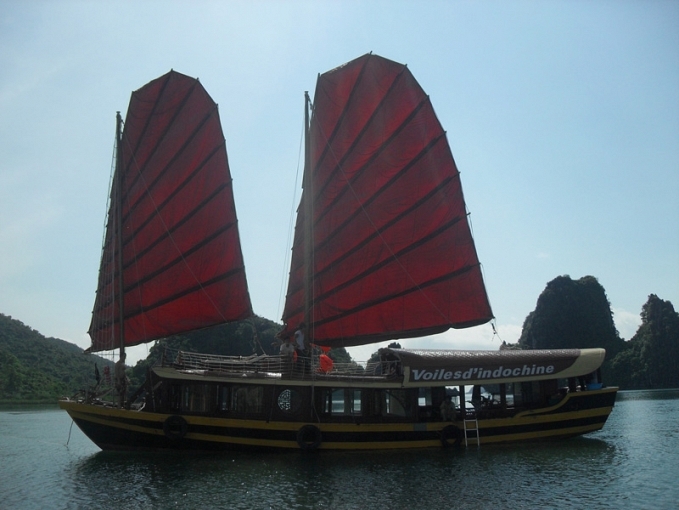 Back on board to cruise to Bai Tu Long Bay, the bay where children dragons would have gone down. Bathing and relaxing on Bong Bai quiet beach. Seafood lunch close to Dau Be island. If the weather permits it, visit of Ho Ba Ham floating village. Then, cruise to the wonderful beaches of Ba Trai Dao where you could swim. Dinner and night aboard in Lan Ha bay. Watch the sunrise if the weather makes it possible. Breakfast aboard. Discover the beautiful and charming bay of Lan Ha with its small beaches and its floating villages. Discover Viet Hai village in the National Parc of CatBa by biking. Meet locals. Back on board to cruise to a fish tank in Van Boi. Check-out before 10am. Lunch aboard. Disembarkation at Ben Bao harbor at 12h to take the fast boat to Hai Phong and go back to Hanoi. Pick up from your hotel in Hanoi. In Hai Phong, boarding on a fast ferry for a quick crossing to Cat Ba Island. Visit of Cat Ba fish market. At Ben Beo harbor, transfer to our Junk with a welcome cocktail at 12h15. Travel through a floating fishing village. Delicious seafood lunch* and free time to rest while the crew will stop the engine to travel full sails to Ca Cave. Boat-ride to CA tunnel and discover a hidden lake surrounded by cliffs full of monkeys (endangered species). Finally, the Junk will drop the anchor in a remote area free of tourists, in Ong Cam. Dinner and night aboard. Breakfast aboard. Cruise to Rang Dua to visit Me Cung Cave. Back on board to cruise to Bai Tu Long Bay, the bay where children dragons would have gone down. Seafood lunch close to Dau Be island. If the weather permits it, visit of Ho Ba Ham floating village. Then, cruise to the wonderful beaches of Ba Trai Dao where you could swim. Dinner and night aboard in Lan Ha bay.